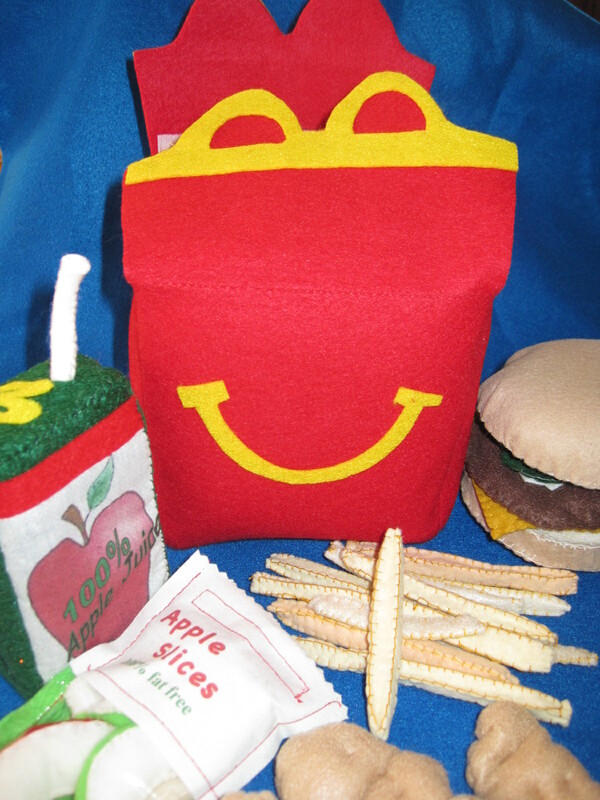 I have had so much fun making felt food over the last year and now I have decided it is time to get back to blogging so I will start with a Happy Meal I made for two little girls birthdays. 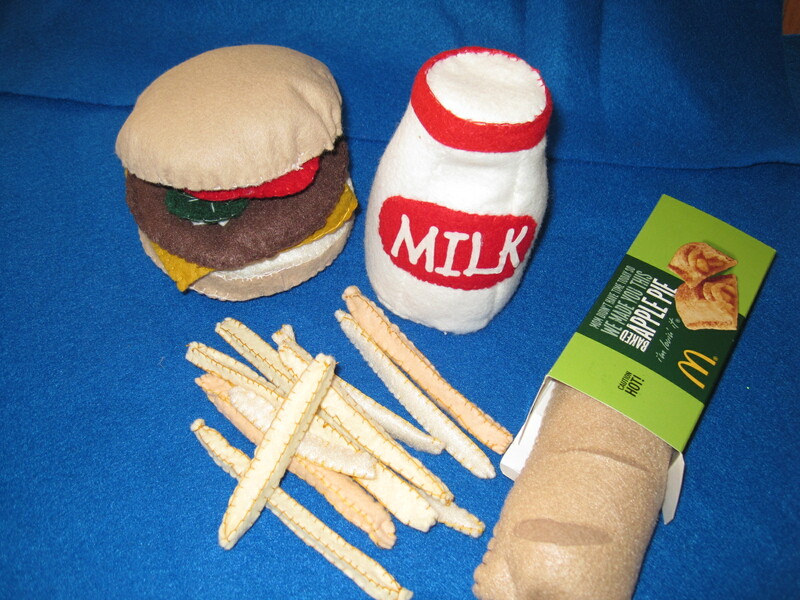 I made one happy meal with a burger and the other with chicken nuggets. This was a very fun project and I did not use patterns for most of the items I just looked online at several tutorials and used their ideas for a reference. The french fries were by far the most time consuming part of the project. It is amazing how many fries fit into the tiny fry box. 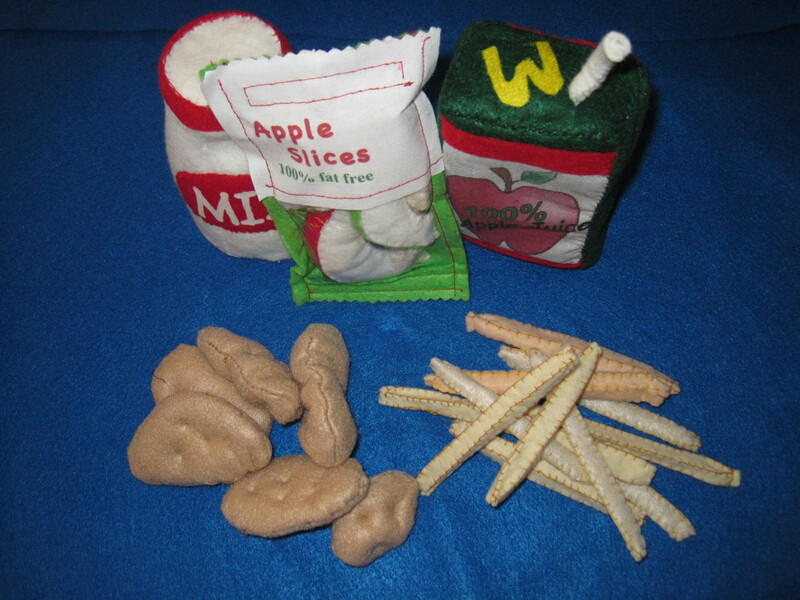 Along with the Happy meals I also made apple pies. Once I finished the food I went to my local Mc Donald’s and they generously gave me the fry and pie boxes. To complete this gift I included a gift card so each of the girls could enjoy a Happy Meal for lunch to go along with their felt toy. 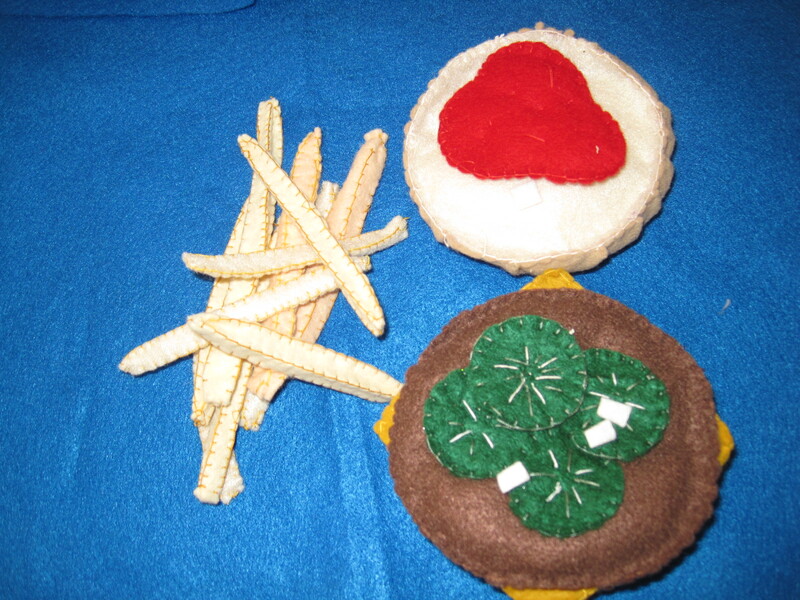 This project was so much fun it has sent me a little crazy with felt food creations. I will post more soon. I made this tool box and garage signs for my brother for Christmas. We drew his name in the family draw and he had requested tools and garage signs without being specific, so this is what I came up with. I made the tool box freehand based on the one carried by Handy Manny I also glued eyes on plastic dollar store tools. Later I found a pattern on Etsy for a felt tool box with tools with the pattern I created additional tools (http://www.etsy.com/shop/GulfCoastCottagePDF). The signs I created on quilter’s fabric you run through the printer. We all got a good laugh when Randy opened the gift. I believe I will be making more of these for gifts, they went together quickly and were very cute. I may even try my hand at creating future patterns for my use. I made this monkey and its twin before my kids and I went to the Wild Animal Park. Mary had fun carry our snacks in it and it sure got a lot of attention. I crafted this without a pattern, I used the idea off a backpack and altered the shape slightly to look more like a face. I added inside pockets and two rings to clip my phone, camera or keys to, it keeps me from losing them in the bottom of the bag. Ring behind ear, great for clipping the camera to.